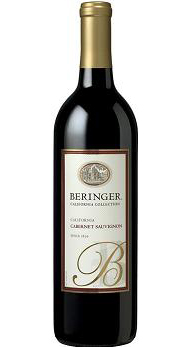 RECOMMENDED: Beringer “California Collection” 2008 Cabernet Sauvignon, Napa Valley, CA. $8.99 or so at the grocery store, available for as little as $5.49 online. Come ON! A 2008 Napa Valley Cabernet Sauvignon for less than $10? Sometimes, nothin’ will do but a big Cabernet Sauvignon. For us Frugal Wine Snobs, the challenge is to find one that’s inexpensive, luscious, and tasty, rather than heavy-handed and sweet. Beringer was one of the Big Vintners whose Cab I first fell in love with in the late ’80s, along with Stags Leap and a few others. However, suddenly, the style seemed to change and the affordable Cabs were no longer big and complex, but overbearing, jammy, and cloying. After wasting money on a few of these bombs, I gave up. For the longest time, I simply didn’t even bother with the California Cabs. Then the Australian “critter wines” came along and kind of took over where the California Cabs had been. It’s as if the state’s winemakers breathed a sigh of relief and, taking off their let’s-please-everybody costumes, went back to their roots. Allowing the Australian mass-manufacturers to take up the “beginners’ wine” market, the Californians began making decent wines again even at the dirt-cheap price point. I confess buying this wine NOT expecting to like it. However, I was really pleasantly surprised from the get-go. Besides being really good, this wine is usually available at the grocery store, and on an afternoon hunt for those last dinner-party ingredients, this can really come in handy. Of the inexpensive Cabs we’ve reviewed here so far (Biltmore, Excelsior, Liberty School, Red Diamond, and now the Beringer “California Collection” Cab), only the Beringer and Red Diamond are consistently available at the grocery store. This Cab is attractive and elegant from the first sip. With big, chewy, black fruit flavors, threads of vanilla and oak are woven throughout. It’s a lovely wine that is full-bodied but didn’t club me over the head once—just got along with me and offered a satisfying experience from start to (long) finish. No other winery worldwide has had its wines on Wine Spectator’s Top 100 list more often than Beringer. In operation since the 1870s, Beringer Vineyards holds the distinction of being the oldest continuously operating winery in the Napa Valley. It is also one of the very few wineries that survived Prohibition.